Hey friends! If you’re reading this, it means our search engine optimization is working swimmingly, and with any luck, you are at least peripherally interested in the purpose, process, and inspiration for fermentations we are fostering. 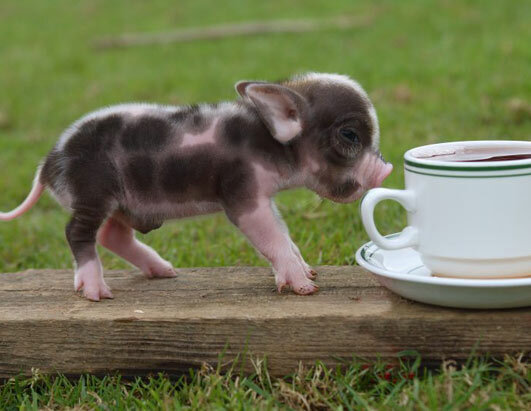 If you’ve wandered here by mistake, or you are already bored of my incoherent ramblings, I offer you this picture of a teacup pig - hopefully now this hasn’t been a complete waste of time! Thanks for the cute distraction, Fanpop! WHO THA HECK IS BRANDON BOLDT? Now, where were we? My name is Brandon, and I’m hopelessly enamored by fermentation. Nurturing trillions of organisms, individually invisible to the naked eye, to dine on sugar and create a favorable byproduct is my favorite mingling of science with art. It’s truly mutualistic how we as fermentation fanatics are able to cultivate microbes to craft inviting nourishment. This process closely resembles evolution in landscape ecology, transforming the barren landscape of proteins, polysaccharides, and minerals into an oasis of flavor-rich compounds (think esters, phenols, and organic acids), tantalizing gasses, and alcohol. Whether stimulating the perfect rise for proofing dough, directing a favored organoleptic profile for beverages like beer, cider, mead, sake, wine, and kombucha, bringing fruits and vegetables to selectively pressure balanced lactic acidity for long-term preservation, or culturing dairy for the likes of kefir, yoghurt, or cheese, the yeast and bacteria that comprise our microflora are the true magicians! TLDR; fermentation is super rad. In my contributions to this blog, I will mostly focus on the results of fermenting grains and fruits for the production of beer, although my goal is that respect and curiosity for fermentation at large will introduce a range of techniques and inspiration that aims to dissolve arbitrary boundaries, perhaps inadvertently erected with the industrialization of process. A disclaimer: I am not a biologist or biochemist! My background is in geochemistry, with a specific emphasis on paleoclimatology. My point here is that while I’ve been fortunate to learn from passionate, patient, and overly generous experts in the field of fermentation, as well as take advantage of books and articles available, I’m not myself classically trained and I sincerely hope this blog can be an open learning experience for us all and not a series of soapbox speeches on the issues within our industry nor a delusionally pretentious set of lectures on why we “make beer” the right way. Please, post questions or comments in regards to anything you are curious about, even if not clearly related to the topic, as continual conversation will be much more enjoyable than a web journal. Inevitably, when I can’t satisfactorily answer a question, we will seek guidance from resources way smarter and more experienced than myself... so let’s get to it! It’s been awhile since I’ve felt the urge to put together a recipe for IPA, and for those of you who don’t know me well, I’m not the type to set fermentation in motion without a sincere purpose. To be clear, I’ve got nothing against any incarnation of the style and I can happily shout from the rooftop that if you’d like to drink a beer, please brew it (as long as it doesn’t endanger the consumer)! My exploration of IPA, which I’ll broadly define as barley-based fermentations that bolster hop-dominated aromatics, started as a homebrewer in 2005 inspired by the crisp blonde ales of the West Coast. Given that I attended a small liberal arts college in upstate NY, access to commercial examples of “West Coast IPA” at the time was limited, and experiences with the likes of Ballast Point’s Sculpin IPA and Green Flash’s aptly named West Coast IPA drove an obsession with beers that legitimately espoused flavors of grapefruit, sun-warmed pine trees, and dank/resinous weed. Meanwhile, across state lines in Vermont, beautifully balanced fermentations that more delicately cradled hop compounds were beyond my palate’s comprehension. Fast-forward to the beginning of my professional career in 2014 over at Odd13 Brewing, where I was responsible for brewing over a hundred batches (at 10bbl scale) of West Coast inspired hoppy offerings as well as with toying with less traditional fermenters such as Belgian isolates of Saccharomyces and Brettanomyces, and lactic acid bacteria. The confluence of severe palate fatigue (yeah, my tongue was no longer craving bitter, and weed was now legal in Colorado), close to a decade of additional… let’s call it maturity?..., and multiple trips back to New England to visit family (which inevitably meant touring local breweries) lead to newfound appreciation of how hops were being utilized in Vermont breweries like the Alchemist and Hill Farmstead. For me, the notable aspects of these new sources of inspiration can be characterized by restrained bitterness, an unexpectedly creamy mouthfeel, and aromatics brandishing ripe tropical fruit and the oils of freshly zested citrus. Sure, these beers were not brilliantly clear like I was taught necessary for nearly every style except German and Belgian wheat beers, but I’ve never been known to drink with my eyes and therefore couldn’t care less. Lastly, massively shifting the addition of hops from the boil (which provides much of the isomerized alpha acid bitterness present in “traditional” IPA) to post-boil infusion in the whirl pool, during fermentation, and post-fermentation as dry hop additions in order to preserve raw hop aromas, provide compounds for biotransformation by our yeast friends, and to mitigate bitterness in the finished beer. Like most newer concepts, there was a contemporaneous rejection by traditionalists and desire for rapid innovation by early adopters. In the case of brewing an India Pale Ale in Colorado inspired by contemporaries out east (other major sources of inspiration at the time included Trillium, Tree House, and Tired Hands), the traditionalists were outraged by lack of clarity, while the early adopters were driven by a desire to further amplify fruit-forward flavor profiles and increase the chewy and often labeled “fluffy” mouthfeel. Let me be clear (not hazy… see what I did there?!?) - in my opinion, the objective for this type of fermentation (and I’d argue fermentation in general) shouldn’t be visual. Stated in bold and caps lock: HAZE IS A BYPRODUCT OF TECHNIQUE, NOT THE GOAL. The logical extension of the previous statement suggests that if you are a brewer adding an element like flour to maintain stable haze in your beer, or a consumer seeking out only the most turbid offerings, you may be missing the point of the style completely. I will say, however, in many ways I consider myself part of the problem rather than part of the solution, in that my goal for a balanced fermentation profile quickly took the sidecar (yes, in my analogy I’m driving a motorcycle and sidecar rather than a stuffy sedan) to bold hop oils. As an early adopter, I was one of many brewers playing with the different dials to experiment with how thick in mouthfeel and hop-saturated a beer we could make, veering from IPA to beer-based milkshakes (I’m looking at you lactose and fruit puree additions! ), which will surely become a recognized style of its own in the future. Perhaps, in the words of Dr. Ian Malcolm, we were so preoccupied with whether we could, that we didn't stop to think if we should. And thus began the space race for hopping rates, braggadociously measured in pounds per barrel (lbs/bbl) and even approaching rates of pounds per gallon (lbs/gal), analogous to a similar competition for IBUs in IPA a decade prior. While I personally burned myself out on this style by late 2017, let me once again pledge undying support of any style of fermentation that makes people happy, even if it doesn’t light my fire! That brings us to January 2019. After a more than a year of essentially “limiting” beer consumption (I put limiting in quotes because no doctor who would like to keep their license could in good conscience describe my alcohol intake as limited) to nuanced and quaffable lager and spontaneous beer, I’m ready to cautiously reinvigorate my love for IPA. This time around, I’m hitting the proverbial reset, aiming for a restrained take on “Juicy or Hazy IPA” (despite my disdain for the style name, I am pleased the Brewers Association entered this style into official guidelines in 2018) that blends in the easy drinking, crisp structure characteristic of German-style Helles. Enter “The Heirloom”, my first batch targeting the aforementioned profile. The Heirloom is a Hazy IPA that (a) sits upon a grist of 65% Pilsner, 32% Spelt (an heirloom wheat cultivar), and 3% acidulated malt (for mash pH optimization), (b) contains a subtle Calcium Chloride addition to the mash (not too shockingly, in the spirit of simplicity I’ve noticed “less is more” for adjustments to our water, often opting for negligible to no adjustments), (c) is modestly hopped at a rate of ~2lbs/bbl comprised of Amarillo, Eldorado, Simcoe (3:2:1) introduced post-boil to the whirlpool, during the tail-end of fermentation, and as a single dry hop addition to push forward an aromatic blend of mango, peach, and orange juice, and (d) is fermented with an expressive English ale yeast strain at a relatively low pitch rate and temperature to selectively pressure an apricot-forward ester profile. Our spelt IPA, The Heirloom, brewed in collaboration with Denver Milk Market; photo by Stacey McMahan. Despite what I now recognize to be a long diatribe that has certainly lost 99.9% of readers, if you are in the .1%, I’ve actually left out a bunch of specific details - not for any lack of transparency or proprietary recipe bull crap, but for the purpose of keeping this post at least somewhat legible. If you would like any additional details, please post a message below and I’ll be more than happy to dive further down the rabbit hole. Oh yeah, for my marketing sisters and brothers: the first batch of this concept will be released as the fourth collaboration between 4 Noses Brewing & The Denver Milk Market. Our name for this fermentation, The Heirloom, stems from the major use of spelt, an heirloom wheat cultivar, as the protein-rich adjunct in the grist. This is not the hoppiest, haziest, nor most intense beer on the market, far from it! My hope for this beer is repeated drinkability, utilizing techniques to minimize hopping rates while maximizing aroma in order to keep this beer as digestible as possible. As I’ve mentioned in relation to my love of lager and spontaneous beer, I most want to provide an experience for you that is simultaneously tantalizing to the senses while comforting to the palate, even after repeated responsible consumption. L’chaim! Whimsy Gets A New Look!